November in the Burton Closes Care Home in Bakewell. are immense, and he will be greatly missed. 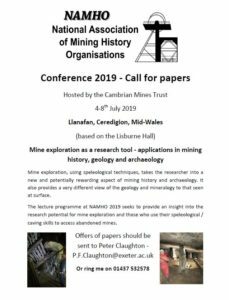 the mining history community, and beyond. A full obituary will be published in the April Newsletter. The quarterly newsletter usually carries a section: Observations & Discoveries. Adam Russell constructed an index which Rob has converted to a database which can be seen in the Members section of the web-site. Each site in the database has links to both Ordnance Survey and Google maps in order to benefit from the unique features of each. This is now enhanced with Google and OS maps showing all indexed sites on a single map with clickable links to the relevant newsletters. It is hoped that this will encourage more members to lead heritage walks by helping identify sites to visit and providing easy access to the often extensive O&D notes about those sites. A demonstration of that is below in a short video, the image quality is compromised in order to reduce the file size and make the video load faster. You can change the settings to HD for a better image and click the bottom-right icon to make it full screen. The database and interactive maps can be found in the members only section of the web site. This was an experiment to see if a mid-week daytime walk would attract any participants. It did, 11 on the walk (could have been more, a further 2 missed the start point and one had to cancel). It was also an experiment from the leader’s perspective, claiming limited knowledge and welcoming corrections and additions from the participants. That aspect worked out OK too. It was a pleasant woodland walk of about 7km featuring, as well as some items of lead-processing interest and extractive industries, other natural resources and non mining historical features dating as far back as 2-3000 BC. A map and full details are available on this web site to logged-in members as a PDF.